Printed on processed chlorine free 100% recycled paper. Cover and other 12 pages, including 4 special artworks, are letterpressed up to 5 colors together, on French Company Dur-O-Tone Butcher White 80 lb. paper, with Vandercook press by SWAYSPACE in Brooklyn, NY. Each copy is numbered and stamp-signed by eBoy and comes inside a glassine envelope with a special 280x430mm index poster. The idea behind this issue is to translate on paper the Blockbobs art toys concept. 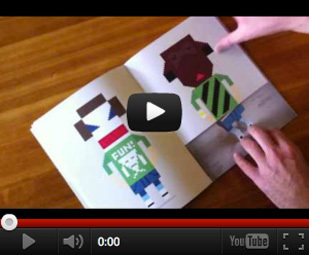 The pixel sketches are reproduced on paper in the same size and proportion of the wood toys. Kai Vermehr. The driving force behind eBoy was to embrace the new possibilities of the emerging digital art world at its base, the pixels. eBoy is among the inventors and leaders of pixel art: a digital, modular-based work system started to evolve and resulted in complex pixel-based visual artworks. They also produce Art Toys based on their pixel sketches. eBoy is now based in Berlin, Germany and Vancouver, Canada; they have worked with clients and partners around the world; among them: Adidas, Coca-Cola, Pepsi, DKNY, MTV, New York Times, Wired magazine, Groove Armada, and many more.